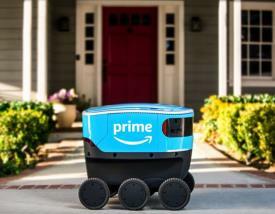 Amazon Evaluating ‘Mobile Cooler” for Home Delivery. The Amazon Scout has been unveiled in an undisclosed suburban location Snohomish County. The six-wheeled delivery unit is designed to be autonomous although currently requires a ‘shepherd’. The intent of the project is presumably to make ‘last-mile’ deliveries by trundling along (hopefully) smooth and level sidewalks adjacent to customers’ homes. The concept is flawed and represents an extreme manifestation of gadgetry for the sake of gadgetry. These modules if deployed as autonomous units will end up as road kill and the small bags of groceries being delivered will be vulnerable to theft. The Scout is yet another example of West Coast over-application of robotics, computer vision and hardware development that currently could be achieved by a pack mule, given the need for an accompanying person. It is possible that the concept could work in a high-density gated retirement village given that similar robotic vehicles deliver mail and supplies in hospitals. Curbside delivery of milk and bread to homebound people could provide a benefit but how will Scout negotiate a driveway of porch? And at what cost compared to alternatives? Jeff Bezos you need to check on the R & D budgets since this project advertising for 21 development specialists could be diverting resources from some other opportunities in your core businesses that offer a more reasonable anticipation of ROI.